Invitations offer a great opportunity to communicate some of what you both appreciate about each other’s backgrounds and traditions. Whether you’re using an online vendor or crafting your own from scratch, you can use this first “official” expression about your wedding to share a taste of the interfaith aspects of your wedding. How you do that really depends on what best suits the two of you specifically. Phrasing like “as we honor our two faiths” or “we welcome friends and family of different traditions” can set a tone of inclusion and welcome. 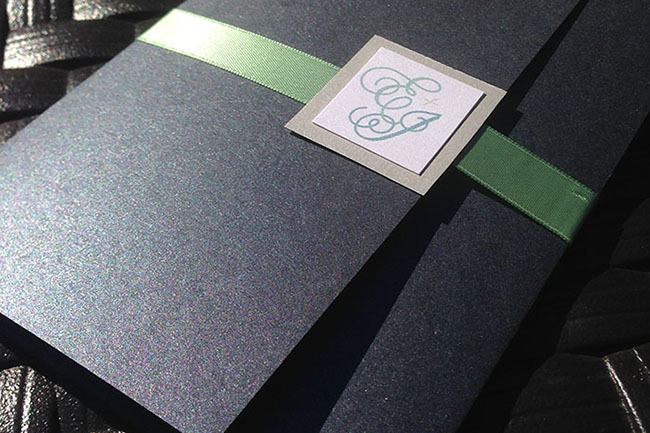 If you’re having printed programs at your wedding, they offer an opportunity to help guests understand aspects of your service that may be new to them. If you are including some of the classic Jewish rituals and blessings in your ceremony, you can use your program to provide short definitions of those parts of the service. Similarly, you can offer brief definitions of other religious or cultural rituals, and doing so can help many Jewish guests understand those elements better. For example, popular Christian wedding rituals like reciting vows (“I dos”), lighting a unity candle and reading from scripture aren’t necessarily familiar to some Jewish guests. Simple definitions of any religiously specific elements of your ceremony, offered in a warm, inclusive tone, can help everyone feel welcome. You can search online for wedding program definitions and find many examples. Some of these sites are from vendors who hope you’ll use them for your programs. Pinterest and Tumblr, and similar online interest blogs also offer examples of what others have done. You can also use your program to share other kinds of important information. Some couples include things like: special thanks to specific people; dedications in memory of loved ones; acknowledgments of ritual items that are family heirlooms; poems; or even practical things like directions to the reception. You can also get creative with your program’s format and packaging, or use it to give guests a chance to do something active to participate in your ceremony (like write down personal wishes on a provided blank page or use an attached bottle of “blowing bubbles” to create a flurry of bubbles during the recessional). Websites like www.bridalguide.com have some fun ideas. Finally, for guests who are hearing impaired, your program can offer information that helps everyone stay connected to what’s happening during your ceremony. Your program can also help communicate useful information for guests who are alter-abled, such as a simple map highlighting wheelchair accessible pathways to the reception, etc. Food choices at your wedding are another opportunity to express values of inclusivity and to educate guests who may not be familiar with specific religious food practices. Some couples have decisions to make regarding whether to have certified kosher food or food that is limited to other religious traditions’ practices. Some couples opt to limit the food and drink at their wedding to a “common-denominator” set of foods, offering items that are acceptable to the widest possible range of anticipated guests. Others decide to serve what they want while making sure appropriate alternative food options are available for guests who follow religious or health dietary practices (like food allergies). It’s important to think through your food and drink plans, not just in terms of honoring sensitivities to guests with different religious practices, but also in terms of other issues. Some couples, for instance, don’t offer alcoholic beverages if that is helpful in supporting guests who are dealing with alcoholism. 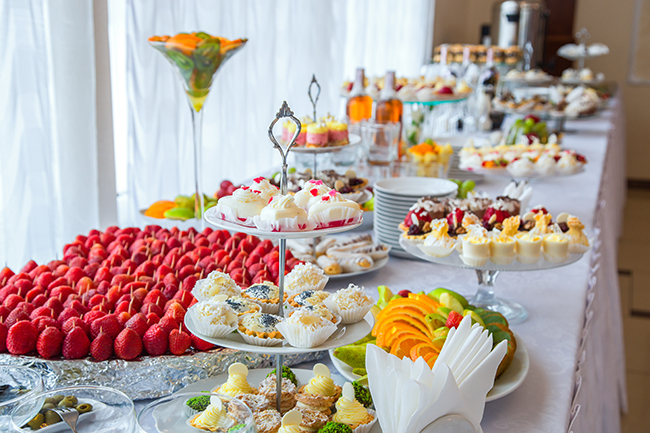 Many wedding caterers will offer to label food items according to different guests’ needs. If you want to have kosher food available at your wedding, plan ahead for what can sometimes be a much higher cost. This is especially true for kosher catered meals involving any kind of meat or poultry. Going vegetarian, or just steering around meat and poultry, can help reduce costs. If your desire to have kosher food is based on the needs of specific guests, talking with them in advance can be helpful in determining the specifics of what they can and can’t eat, and what alternatives to kosher catering might work for them. At the end of the day, the decisions are yours, and it may not be possible to fully meet every guest’s optimal food practice criteria, but as with most issues, honest and thoughtful communication usually helps. Your wedding invitation may be a good place to say what the food and drink will be like – “all food will be vegan” or “contact us if you have special dietary needs” lets guests know that you care about their food concerns. Finally, a word about kosher wine. Outside of the Orthodox Jewish community, few Jews follow traditional practices regarding kosher wine. Nevertheless, some interfaith couples like to include kosher wine, or even limit their wedding to only kosher wines, in order to honor Jewish traditions or accommodate specific guests.